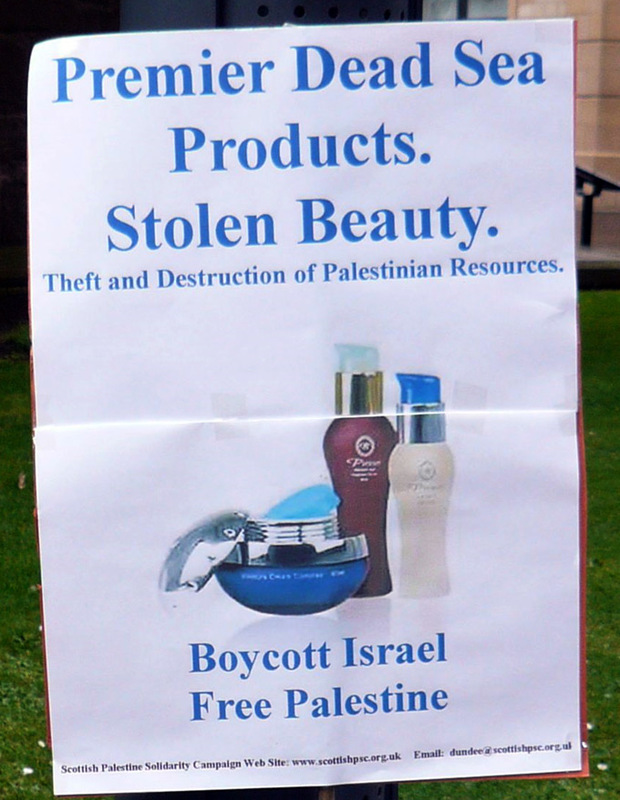 Following months of determined picketing, leafleting and complaints to the management of the shopping centres, Israeli cosmetics company Premier Dead Sea Cosmetics has been ousted from Johnston Court Shopping centre in Sligo (Ireland) and Dundee’s Overgate shopping centre (Scotland). The managers of the Overgate shopping centre had initially shown total disregard for ethics stating that "whilst we are aware of the illegality of the Israeli settlements under international law, in the event that the products in question had originated from within the settlements, our international legal advice has confirmed that it is not illegal in the European Union to trade in goods originating from within the settlements." Following the weekly protests at the Premier Cosmetics stall the management had however taken steps to move the stalls from their prime location to be hidden under a set of escalators. 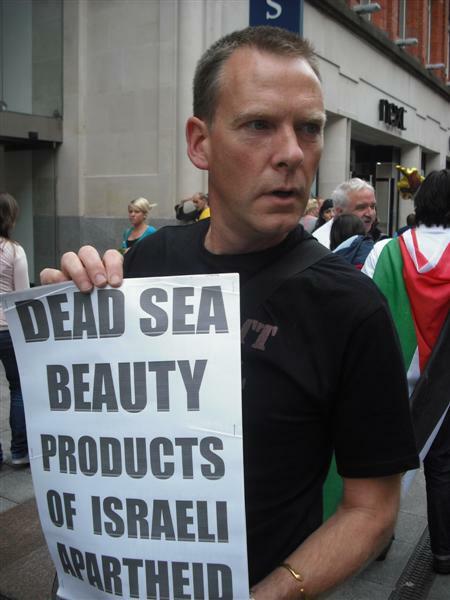 Dead Sea products stalls are usually manned by Israelis, and as discovered by activists picketing the stalls in Jervis shopping centre in Dublin, the Israelis are often ex-IDF soldiers. One member of staff admitting to taking part in military operations in Ramallah whilst another in serving the Israeli air-force in operations over Palestine. Eight Israelis manning the stalls in Bristol's Cribbs Causeway shopping centre were arrested by the UK Border Agency in December 2009 for working illegally in the UK (having entered on visitor visas), and the next day they were deported back to Israel Following the arrests, similar stalls in Bristol's Broadmead Galleries shopping centre were seen left deserted. 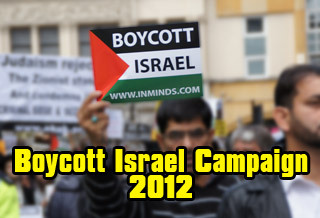 Congratulations to the determined activists in both Silgo and Dundee, through their persistence they have achieved another victory for the BDS movement. The Dead Sea Premier Cosmetics Laboratories, located at 5 Modeen Street in Lod in Israel, was established in 1990 and is part of Hadan Group. 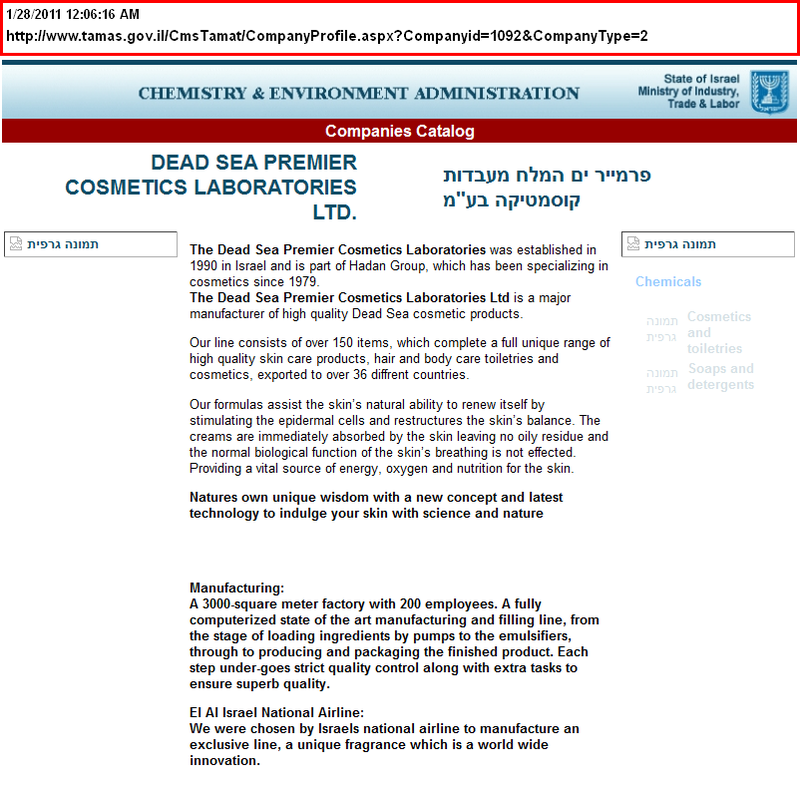 Israels Ministry of Industry describes the company as "a major manufacturer of Dead Sea cosmetic products.. line consists of over 150 items, which complete a full unique range of high quality skin care products, hair and body care toiletries and cosmetics, exported to over 36 different countries." 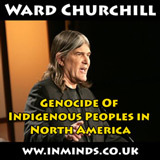 They boast of operating a "3000-square meter factory with 200 employees. A fully computerized state of the art manufacturing and filling line.." and with having special links to El Al "we were chosen by Israels national airline (El Al) to manufacture an exclusive line, a unique fragrance which is a world wide innovation." Kibbutz Kalia, which describes itself as a holiday village, is an illegal Israeli settlement on the North coast of the Dead Sea. One of its main sources of income is tourists visiting the Dead Sea, charging each tourist around £20 to swim in the Dead Sea. Corporate Watch reports that Kalia beach tourist centre sells dead sea mud and mineral products by Premier Cosmetics (as well as by Sea of Spa and Ahava). Kalia is a settler owned cooperative which also owns 7.5% of Ahava Dead Sea Laboratories, another cosmetic company profiting from illegal occupation.